A US-based company has recently won a bid to sell power at historic low tariff of Rs 4.63 rupees per unit in India. SunEdison received this contract after National Thermal Power Corporation of India released a tender for a 500 MW solar park in Andhra Pradesh. The tariff with which SunEdison has won the bid is 8 per cent below the previous low of Rs 5.05 and 15 per cent below the industry average. But this fall in tariff rates is not sudden. The tariff per unit of electricity has gradually fallen from Rs 17.91 in 2010 to the current value of Rs 4.63. For a long time, Rs 5 per unit value was being seen as a tariff barrier as the rates were not slashing down to below that value. However, the lowest bid results in the recent past are Rs 5.05 in Madhya Pradesh, Rs 5.09 in Punjab and Rs 5.17 in Telangana. These tariffs, however, were attained after a planned effort. Since 2010, the government has been involved in implementing reverse auction (an auction in which project developers compete in the bidding process and the lowest bidder gets the project) for solar projects, to bring down the tariff. Union power minister Piyush Goyal said that the government is now working to bring the tariff further down to Rs 4 per unit. According to International Renewable Energy Agency (IRENA), the solar Photovoltaics (PV) module prices have fallen by 80 per cent since 2010 and the electricity cost from large-scale solar plants has halved between 2010 and 2014. Although it is good that the tariff is reaching new lows periodically, it is also important to consider if the projects can be implemented with such a low tariff. There have been instances where the actual production could not happen because of low bids. “Solar power is now cheaper than thermal, or even all forms of energy production,” says Pasupathy Gopalan, president and managing director of SunEdison Asia-Pacific. Kushagra Nandan, chief operating officer of SunSource Energy believes Rs 4.80 to Rs 4.90 per unit would be a feasible tariff for a 500 MW project that can ensure financial viability of a project. 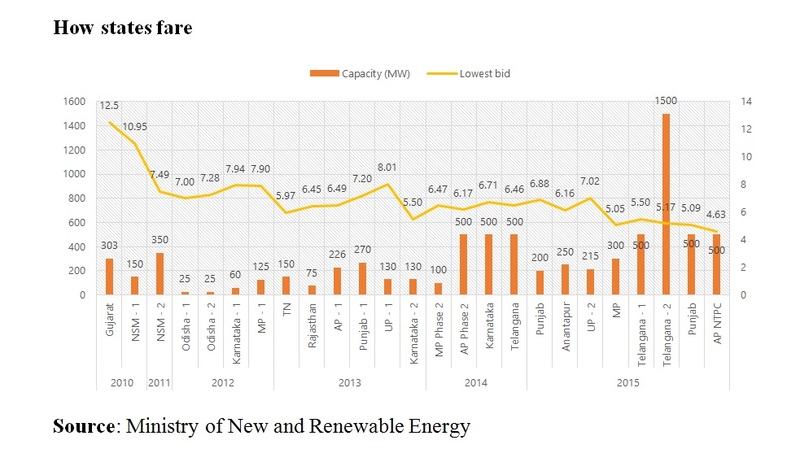 Though Andhra Pradesh bid results can boost the appeal of renewables in India, solar energy still has a long way to go before it can become cost-competitive with coal that costs between Rs 1.5 to Rs 5 per unit. KPMG, a financial services company, in its recent report had forecasted that solar power will get up to 10 per cent cheaper than coal-based power by 2020. Project developers, however, are raising concerns on the project capacity. Rates have fallen substantially but the capacities of projects that are bid for have not increased. The leading developers are putting aggressive bids just to be relevant in the market. Two months earlier, in the solar tender of Madhya Pradesh and Telangana, a Canadian company SkyPower quoted Rs 5.05 and Rs 5.17 respectively for only 50 MW capacity. The Centre has planned 20 solar parks around the country, with cumulative capacity of 20,000 MW. The next bidding for a solar park would be for Rajasthan. It is expected that the tariff could fall much lower, as the cost of solar park in Rajasthan is lower than in Andhra Pradesh.